I recently played through the old Infocom adventure game Stationfall, as part of one of my periodic adventure game binges, and I found I lost a couple times due to running out of time. 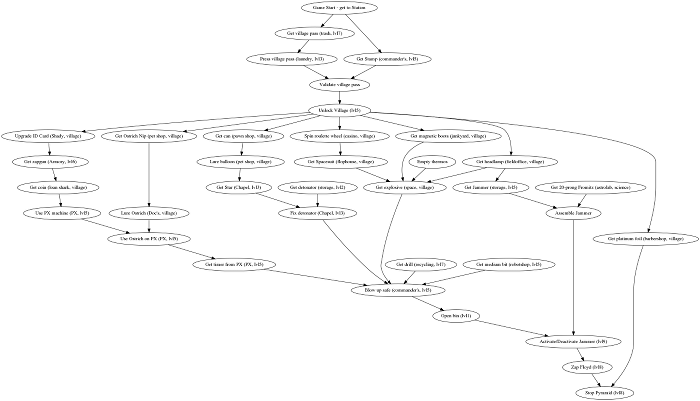 I think that was basically just due to me triggering some events which could've been delayed, but nevertheless I decided to map out the puzzle tree of the game to find a semi-optimal path. That way I wouldn't be wasting time running from one end of the station to the other all the time. Once I did beat the game, I figured I'd fix up the tree slightly to include the whole game, rather than just the main safe-breaking bit (though of course that ends up consuming the most of it anyway). So, here it is! I doubt this'll be of much interest to anyone else, but I always enjoy this kind of visualization, so I figured I'd give it a home regardless. And for the record, here's the path that I ended up taking. Works well, is actually far quicker than you have to be, though, and misses various flavor text (doesn't actually "show" many of the clues you'd actually need to puzzle it out - skips the alien ship, diaries, mayor's office, for instance). will get you there during day 2. Remember to turn off your headlamp on the way out! Then Deactivate the Jammer! omg!